Folio from a Shahnama (Book of Kings) by Firdawsi; Battle between Zanga and Awkhast. 1493-4. Freer Gallery of Art / Arthur M. Sackler Gallery, Washington, DC. Folio from a Shahnama (Book of Kings) by Firdawsi (d. 1020); Giv Brings Gurgin before Kay Khusraw. 1493-4. Freer Gallery of Art / Arthur M. Sackler Gallery, Washington, DC. Folio from a Shahnama (Book of Kings) by Firdawsi (d. 1020); Recto: Rustam before Kay Khusraw under the Jeweled Tree; Verso: Text. 1493-4. Freer Gallery of Art / Arthur M. Sackler Gallery, Washington, DC. Folio from a Shahnama (Book of Kings) by Firdawsi (d. 1020); Rustam and Isfandiyar in Combat. 1440. Freer Gallery of Art / Arthur M. Sackler Gallery, Washington, DC. Folio from a Shahnama (Book of Kings) by Firdawsi (d.1020); Recto: Text; Verso: Kay Khusraw Installs Luhrasp as King. 1493-4. Freer Gallery of Art / Arthur M. Sackler Gallery, Washington, DC. Folio from a Shahnama (Book of Kings) by Firdawsi (d.1020); Recto: Zahhak and Farshidward before Afrasiyab; Verso: Text. 1341. Freer Gallery of Art / Arthur M. Sackler Gallery, Washington, DC. Folio from a Shahnama (Book of Kings) by Firdawsi (d.1020); Rustam Encamped. 1425-1450. Freer Gallery of Art / Arthur M. Sackler Gallery, Washington, DC. Loeff, Patrik M. "Indien: Sanchi." Digital image. January 27, 2008. Accessed August 21, 2010. http://www.flickr.com/photos/bupia/2276914716/. "Mahmud of Ghazni." Digital image. Khyber.org. Accessed August 21, 2010. http://www.khyber.org/articles/2005/TheKhalajWestoftheOxus.shtml. The Makhzan Al-asrar (Treasury of Secrets) by Mawlana Haydar. 1577. Freer Gallery of Art / Arthur M. Sackler Gallery, Washington, DC. Omar, Mohammad, performer. "Rubab Solo." In Music of Afghanistan. Smithsonian Folkways, 1961. Rashid Al-Din’s 14th-century Jami‘ Al-Tawarikh (Universal History). Edinburgh University Library, Edinburgh. Shahnama (Book of Kings) by Firdawsi. Freer Gallery of Art / Arthur M. Sackler Gallery, Washington, DC. At many times throughout history, the people of today’s Afghanistan found themselves at the mercy of a foreign power. But at other times, as during the reign of the Ghaznavids, the lands of the Hindu Kush became the center of the world. The invasions of the Turkic and Mongol peoples, starting with the Ghaznavids in the 10th century and stretching to the Mongols in the 13th century, were based upon their cavalry. The horses gave the Turkic and Mongol peoples a tremendous advantage over the settled civilizations in Afghanistan and undoubtedly facilitated their success. The calvary and military skills of the Ghaznavids enabled them to overthrow the Samanid Dynasty. Surprisingly, they first learned these skills in an unlikely place: when they were pressed into serving in the slave guard of the ruling Samanids themselves. Slavers would go out into Central Asia and other places and steal children, and then raise them to be soldiers. But they didn’t just put guns in their arms, they taught them poetry. They taught them to be knights and they taught them how to run an army. And so these warriors were very cultured, very strong, very organized were able, of course, to take over. And so, we see the way that the first successful waves of these are able to topple the Samanid Dynasty, and the first one that’s set up is the Ghaznavids in Ghazni. Mahmud, the first king of Ghaznavids, established the center of their empire in Ghazni, in southeastern Afghanistan. 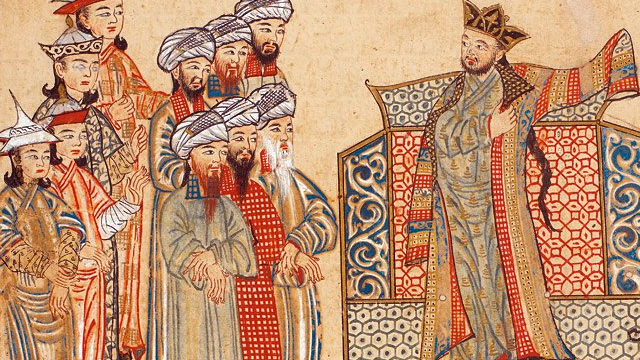 Mahmoud of Ghazni, the leader of the Ghaznavids and the most prominent ruler of the Ghaznavids, was an ardent Muslim. He helped to convert the population of Afghanistan to Islam. It is from this point on that we can talk about an Islamic Afghanistan. In the late tenth and eleventh century under the Ghaznavids, Afghanistan was a center of culture, and a world power. This is when Islam expands into India; Mahmud is known as the Great Conqueror, Mahmud the Conqueror, because he brings Islam to India. And you have to imagine, opening up into India brings you great riches. India was a tremendously rich land; it’s the land of the elephants; it’s the land of marble. And hence he brings some of that loot back and he uses it to build magnificent palaces. We know the minarets that he and his successors built. And these are testament to the kinds of patronage that were going on at that time, when Afghanistan was the center of the region. Mahmud wants to be not just a warrior conquering king, but he wants to be known as a great king. And what do you need to be great? You need poems and art and you need beautiful buildings and you need intellectuals at your court. So he uses all his powers of paying people and cajoling people and twisting their arm to come into his court and to make it a really flowering glorious center of culture. And so, people wanted to go there also because they knew they could get paid. The Ghaznavid court represented a fusion of Turkic and Persian cultures for the first time in Afghanistan. The Turkic administrative and military strengths created a strong and properous rule, under which the Persian artistic traditions of poetry and painting could flower. Once again, a unique hybrid developed at the crossroads of cultures. The Ghaznavid court ushered in a fusion of Turkic and Persian cultures. Once again, a unique hybrid developed at this crossroads of cultures.